Best Electric Meat Grinder for Home Use? You need to read this before buying. Why do you need an electric grinder? Because preparing meat can be a long, excruciating process. 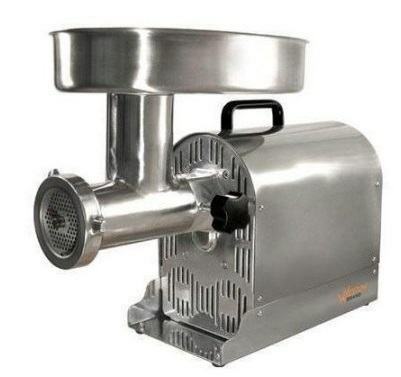 With electric grinders, you’ll have a motor powered engine that helps cut through the meat faster than normal methods. And if you’re looking for a grinder, the Weston 08-221 is the right one for you. We’ll briefly discuss why the Weston 08-221 is the standard for home and professional chefs. Since it’s lightweight, you can use it in crowded kitchens where mobility is needed. Keep reading this guide to figure out if this grinder is the right asset you need for your kitchen. The Weston 08-221 Electric Grinder is known for its quality and the satisfactory results it delivers. For instance, it has a 1 HP motor which gives you the ability to cut 725 lbs of meat in one hour! First things first, this device has two grinding plates. One is for coarse cutting (3/10 inches) while the other is for medium cutting. (⅕ inches) This gives the user a clear advantage as they have a wide option as to why fine their meat needs to be cut. Plus, you can purchase additional grinding wheels if needed. We also like the product’s conveyour like system. This allows for the meat to be cut in a smooth and streamlined process. With a 3 inch feeding throat, you won’t have any issue cutting your meat and getting it caught in the machine. Other grinders have no tray guards to use. But with the Weston 08-221, it has a tray guard that stops the meat from making a huge mess. It acts as a placeholder for the meat and is another feature that makes this device worth buying. And, the Weston 08-221 has three 7-inch long sausage stuffing tubes. Made out of 100% plastic, the stuffing tubes have three different diameter sizes (⅞, 11/8, 11/2 inches). 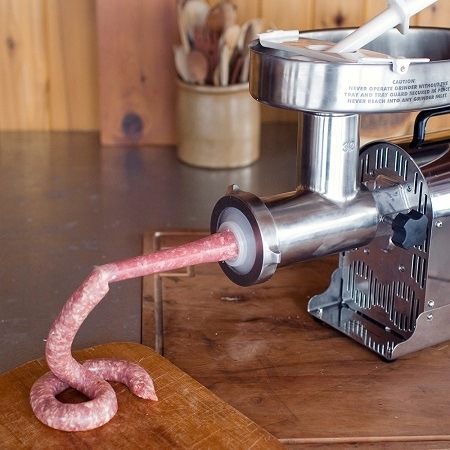 Users like this accessory because it allows them to make sausages faster than manual methods. Check out the Weston 08-221 if you’re looking for an electric grinder that works quietly. It has a oil bathed metal gears that easily lubricate the wheel. As a result, your gears are guarded and are less likely to wear out unlike competing brands. However, there is one flaw that you’ll have to take notice of. While it is a sturdy device at over 66 pounds, it’s not able to power through strong bones. 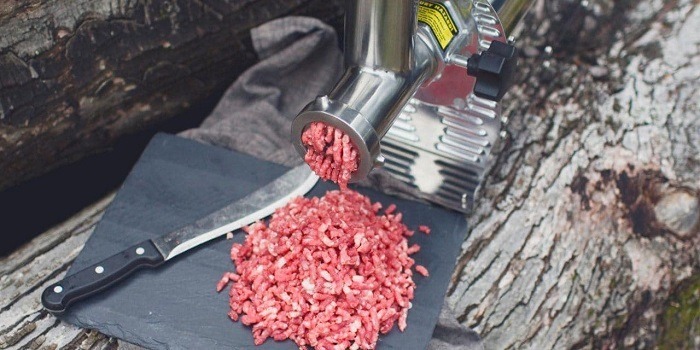 To avoid this, you’ll have to pre-cut your meats before placing it inside the grinder. Basically, the Weston 08-221 Electric Grinder has over 750 watts of speed and a lot of power. If you ever wanted a grinder that can cut through any food you can think of with no problem, this is the machine. Don’t take meat from the refrigerator until you’re ready to grind it. You need a sharp cutting knife. Replace your dull knives to achieve better performance. Get a food safe lubricant to protect and maintain moving parts. Thoroughly sanitize and clean every component after using them. Stainless steel grinders are dishwasher safe. Most of your commercial grinders are not made to cut through animal bones. 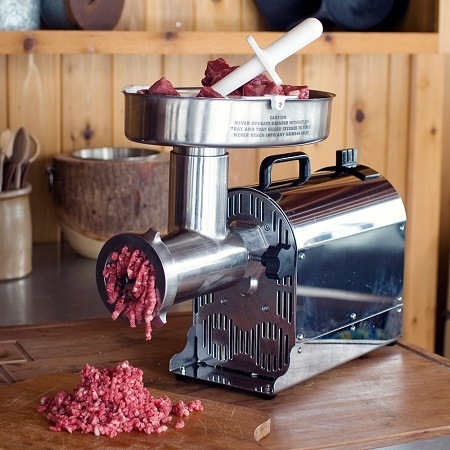 Chill your auger, grinding plate, feed tube, and knife inside a ice bath or a freezer before grinding your batch of meat. Since the grinding will warm the meat up and cause friction, keep your utensils as cool as possible to keep the food safe. Cut your meat into even sized chunks and gently feed it through the funnel. We suggest that you don’t force the meat into the machine for better results. Like with any electric meat grinder, you’ll want to choose a model that’s going to last and will withstand the amount of work you’ll put it through. 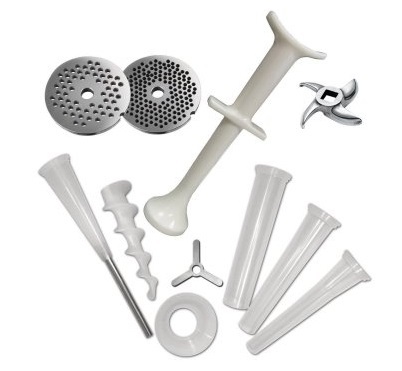 With manual meat grinders, you’ll see molded plastic bodies. It’s less expensive, but is durable and can keep the body together. For electric meat grinders, you’ll want one that has a metal frame. If you want the highest level of strength and protection, look for aluminum grinders. Aluminum is a commercial grade metal that’s designed to withstand a high amount of abuse. This is related to your personal comfort instead of the specific performance of your grinder. However, this is a concept that first time buyers tend to overlook. You need to find a meat grinder that’s very easy to control and operate. Ease of use is even more important when shopping for a manual grinder. They require more effort and manual input than electric models. You have to think about the location and size of the feed tube, because it will impact how easy or hard it will be to operate the grinder. If your grinder is hard to position in the kitchen or is hard to use, then you’re going to waste your money and be less likely to use it. You must think about the amount of free space that’s in your kitchen to ensure that your grinder fits in there correctly. For some users, you can place the grinder in a open area if you use it frequently. Make sure that you have enough room space in your cabin if you plan on concealing your grinder after using it. Manual grinders are smaller than electric models, so they are a good choice if there is limited space in the kitchen. The Weston 08-221 Electric Grinder is the most affordable and useful grinder in the market. One thing that we like about this product is its ability to make snack sticks and high quality steaks. If you really want to make a difference in the results of your food, then buy this product today.